I love starting a topic with the word "on"... it makes me feel like I'm writing some sort of academic paper. 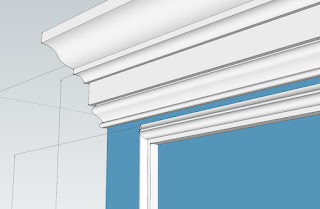 As a self professed "crown master" (this is actually my first time ever doing crown), I thought it would be a good idea to share my thoughts on crown molding with all two of my readers. Why did you decide to do a three piece crown in your bedroom? Crown molding is an elegant way to soften the transition between your walls and ceilings. The really neat thing about crown is that you can stack it up in a number of ways to create a custom profile. I actually went with a three-piece set up, which took a nominal 3" vertical crown and pushed it to almost 6" of depth! Now, I know it doesn't look so hot laying on my desk, but the effect is much more glamorous and dramatic when installed in the room. Real House: Can't you just feel the glamor radiating out from these beautiful walls? I'm going to come clean with you: the dramatic appeal was not my primary goal in putting this crown up. In reality, two of the walls in this bedroom are party walls which, in our case, means the plaster is put right on the brick. In terms of nailing wood to brick, sometimes this can be challenging. And with all the fine woodworking that goes into cutting crown molding, you don't want to be up there trying to smash nails through your finish piece that just won't take. You will be left with a dinged up piece of crown with about 50 nails through it, laying on the floor. So, in attempt to make my life easier and simultaneously obtain a dramatic effect, I first nail up a 1x4 as the backing piece. Now, with this 1x going up, I'm able to take my time with fastening this piece to the wall. And, the good news is: I can use tapcons if I need to, or turn my piece to Swiss cheese by firing in 100+ nails into it, as the entire upper half of this 1x will be hidden by the crown once it is installed! Hell, I can even throw this up there with construction adhesive if I want to. Genius, right? Truth be told: this went up pretty easily, and it sets the tone with a nice level line across the top of your room. The human eye can pick up subtle things like that. But, as you will see in the next post, installing this 1x potentially saved us a ton of time, material, and energy (and I have none of the above). And by using a more flexible piece of Ogee on the bottom, we are able to hide any inconsistencies we have on our walls. Ours have plenty. Hopefully this synopsis explains why we went with a three-piece crown. Please stay tuned as I continue to answer these thought provoking crown molding questions from our readers! Do you have any crown war stories or pictures? Please share your thoughts in the comments!